Early on 11 April, military forces entered a compound in Khartoum housing the Ministry of Defence, army headquarters and President al-Bashir's personal residence. Defence Minister releases televised statement confirming removal of President Bashir, three month state of emergency, suspension to constitution, closure of borders, closure of airspace for 24-hours and plans to install two-year military led transition council. On 11 April, President Omar al-Bashir’s near 30-year reign as leader of Sudan abruptly ended with the military arresting and removing the president from office. Early on 11 April, largely unopposed military forces entered a compound in Khartoum housing the Ministry of Defence, army headquarters and al-Bashir's personal residence. Concurrently, soldiers seized control of the ruling party’s offices, state radio and television buildings. Meanwhile, tens of thousands of anti-government demonstrators marched through central Khartoum, claiming victory. In addition, state media announced an order to release all political prisoners. Following a brief period of uncertainty and rumours, on state television Defence Minister Awad Ibn Ouf confirmed the removal and arrest of al-Bashir and declared a two-year military transitional council. In addition, he announced a three-month state of emergency, a nationwide ceasefire and the suspension of the constitution, including the dissolution of the Council of Ministers and state governments and their legislative councils. He also said Sudan’s airspace would be closed for 24 hours and borders shut until further notice. A night curfew is also to be imposed from 22:00 to 04:00 local time, essentially amounting to an order for the protesters to disband. In response to the statement, opposition party leader, Omar al-Dukair announced the continuation of the protests until the realisation of the "legitimate demands of the revolution". Conversely, a leader in al-Bashir’s National Congress Party called on the Sudanese army to release al-Bashir immediately. The 11 April events followed a four-month street protest movement that was sparked by a rise in the cost of living, but led to demonstrators calling for the president and his government to resign. Of late, demonstrators targeted the military headquarters in an attempt to escalate the pressure on the armed forces to intervene. Most recently, President al-Bashir became increasingly more isolated with some coalition supporters refusing to join counter protests in support of the beleaguered leader. The security situation in Sudan at present is particularly fluid. With protests likely to continue, the military’s patience and restraint will be tested. Protest leaders have consistently called for a civilian administration void of the influence of what they describe as a tyrannous and corrupt regime. In addition, it is yet to be seen if the military will relinquish the large quantities of diverted national budget it has received under President al-Bashir in order to resolve the root cause of the protest movement, which was high inflation. 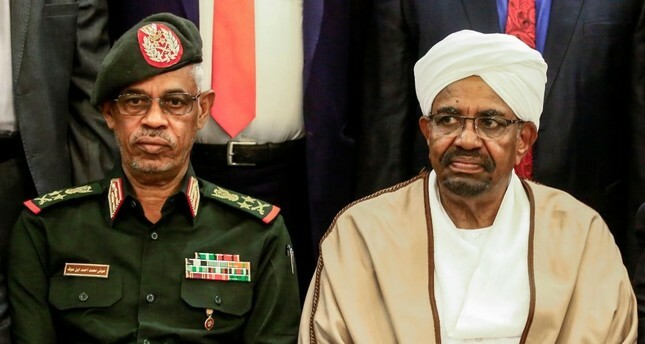 Moreover, as of writing, Defence Minister Awad Ibn Ouf, the head of the new military transitional council, confirmed that President al-Bashir is being held in a safe location. A remark that will unlikely appease the opposition, while angering loyalists within the ruling party. Furthermore, it remains to be seen if the transitional council will bow to international pressures to hand al-Bashir over to the International Criminal Court to face five counts of crimes against humanity, two counts of war crimes and three counts of genocide for directing the fighting in the western Sudanese region of Darfur. Military coups are not uncommon in Sudan, such as in 1989 when al-Bashir was brought to power. The deposition of al-Bashir demonstrates the effect of a sustained protest movement, echoing similar events in North Africa, notably the ‘2011 Arab Spring’. However, uncertainty remains over whether a viable transition of power is possible, with the success of these regional movements varying greatly; notably, the average Sudanese citizen is only 19 years-old and has not known a time without al-Bashir being in charge. Ultimately, the new military transitional council will need to offer compromises to both sides in order to negate a prolonged and potentially violent bout of unrest. While, a power vacuum left by the incumbent could facilitate the threat of transnational insurgency. In the short-term, planned and spontaneous protests are expected to continue, particularly in the major cities of Khartoum, Omdurman, and Port Sudan. With the constitution suspended, the military will be able to operate largely without accountability, threatening further violence including the use of tear gas, batons, and live rounds; the night curfew will be a particular flashpoint. Demonstrations could escalate in intensity quickly. A visible military presence on the streets should be expected. It is advised to be mindful that the security forces have enhanced authority to detain and arrest persons they deem to be undermining public order. The closure of the country’s borders and the airspace restrictions is largely designed to prevent regime figures from leaving the country, potentially with large sums of money. However, the knock-on effect will be the disruption to the movement of ordinary persons and goods. Immediately following the announcement concerning the airspace closure, Ethiopian Airlines, Kenya Airways, Turkish Airlines, Emirates, Saudia and Air Arabia, among others, have cancelled flights. Furthermore, those in the country should be mindful that the ability of consular services to aid nationals in country is likely to be reduced. In the medium to long term, the extent to which a peaceful transition can prevail will heavily depend on how far all parties are prepared to collaborate and whether the authorities can improve economic prosperity. Keep abreast with local news through security alerts, media or asking your host facilitator or hotel staff. In general, stay away from large public gatherings that appear politically motivated. Keep a low profile due to the political tensions. In the event of civil unrest, stay indoors or in your car. Find the nearest exit points and move there in swift and calm manner. Have all travel and professional documents with the proper stamps and signatures in the event a member of the security forces asks.